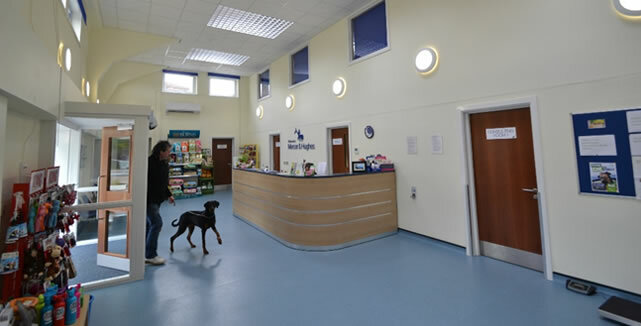 The independent veterinary practice of Mercer and Hughes operates from three sites in North Essex. This project was to relocate their Dunmow branch from unsuitable cramped facilities in a former house into premises that would allow both expansion and rationalization. A derelict industrial building in an ideal location close to the town provided the opportunity. The design incorporated a car park immediately adjacent to the entrance and a generous double height reception area from which consulting rooms, a nurse room and customer toilets open directly. Away from the public area is the whole complex of rooms (including laboratories, a pharmacy, operating theatres and a laundry as well as dog and cat kennels, stores etc.) that constitute a modern veterinary surgery. The building work involved the stripping of all partitions and services and the removal of the asbestos roof leaving only the external walls and concrete frame. The new roof and re-rendered external walls together with a new main entrance lobby transformed the building’s appearance. The mechanical and electrical services within the building are very complex and their integration within the design was a major part of the design and project works. The project was completed in seven months and cost £590,000.